The Alt-Right have figured out a formula that unfortunately works for now. These “free speech” demos are easy for the government to permit, easy for the cops to protect, and easy for them to use as propaganda. They’re also very hard for us to fight against. They’ve found that this formula helps to paint them as the victims against the scary black bloc boogeyman. They’re not going to give up now that they’ve hit on this pattern. We should expect to see more and more demos done in this way, and we can expect more rhetoric from organizers saying they want to “stop the hate” and that this is “about love and freedom for everyone.” Remember, our opponent is cunning and guileless, and will do everything they can to recruit as well as win the hearts and minds of the mainstream. This means that we will be demonized for showing up in bloc. This means they will use every effort to document us shouting at them and throwing things at them. This means they will tackle more of us to the ground and “find” weapons on us to get us arrested. We must prepare for these things. We must not let up our efforts. Instead, we need to expand our efforts. We need to not let these demos act as a distraction for our real efforts. These demos serve as a convergence point for the racists, bigots, and fascists in our neighborhoods. These people are easy to spot, just look for the signs. While they’re busy fighting with our comrades between a line of riot police, those of us who are willing should utilize this time for more clandestine actions. Below are two examples from two recent demos. We cannot tell you what to do, we can only tell you what we’ve done and how it worked. On June 4th, Joey Gibson and Patriot Prayer organized a “free speech” demo in downtown Portland, OR. Hundreds of anarchists and antifa amassed to fight against the fash. We were met with a line of riot cops who managed to keep both sides separated for the duration of the event. When the event was winding down, the police conveniently took the opportunity to use force to push us out of the park. Knowing our true fight was with the fash and not the pigs that day, several of us broke away from the mass. We unmasked and put on our scamouflage to appear mostly normal. We then broke up into groups and went around looking for Alt-Right vehicles. These people tend to arrive together, and thus park together. Generally, finding one vehicle in an area will mean there are several others nearby. We got the info of about 30 license plates. With this, we are then able to create a database with personal info and properly dox these people in our communities. We stayed in groups for personal safety, but the overall risk is fairly low in our opinion. Best of all, we avoided the kettle that captured dozens of our comrades and led to federal agents taking pictures of everyone’s photo IDs. 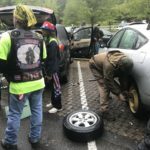 At Evergreen College this past week, Patriot Prayer held another “free speech” rally. Several of our comrades attended this, and utilized tactics from the 4th. Through various scouts, most people at the rally knew the whereabouts of the Alt-Right vehicles. 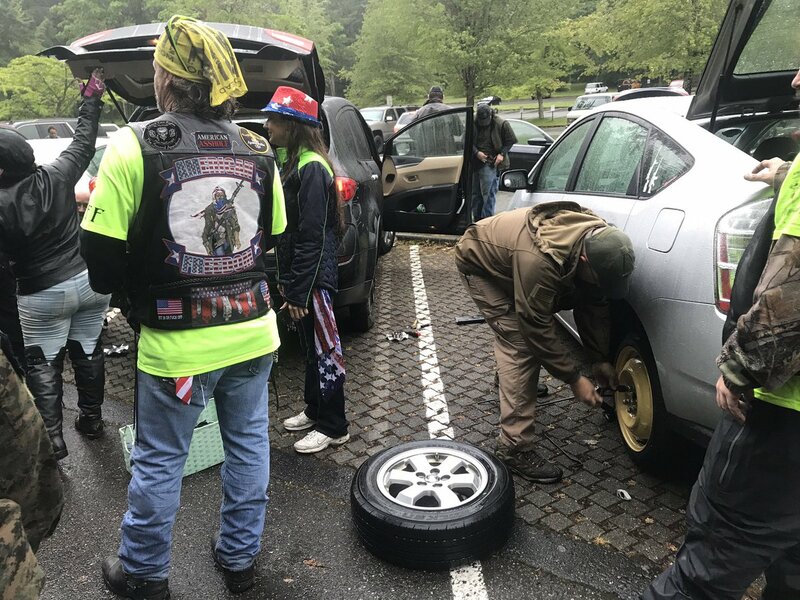 At some point during the rally, when the fash were preoccupied, several comrades headed to the area of the vehicles and slashed several tires. The event organizer, Joey Gibson, had two of his tires slashed. We have read that insurance companies may cover the cost of repairs if all four tires are damaged. We have also been doing research on other ways to enhance a vehicle, especially ways to beautify the cosmetic looks of a vehicle. We suggest others who are interested do the same.